Afghan returnees are building houses in a deserted area in the Shomali plains, two hours north of Kabul. The afghan government moved the refugees from Kabul and gave them this area. 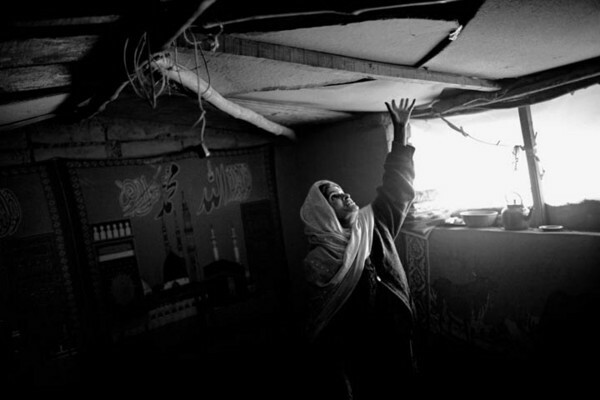 Many of the returned refugees do not have any money and can not afford to build a house. They live in plastic tents and in caves. 45 year old Pekai lives in a cave together with her five children and their farther. - During the winter, this place is ice cold. I am not able to feed my children every day, says Pekai. Shomali plains, Afghanistan, December 6, 2006. Espen Rasmussen, "The Return," in POYi Archive, Item #46210, http://archive.poy.org/items/show/46210 (accessed April 25, 2019).